"Over the weekend, snowboarder Hannah Teter told her boyfriend that she planned to listen to his band's song 'Communicate' on her iPod during her Olympic halfpipe routine. This made him a bit nervous. "Apparently she did not. As the world now knows, Teter - who was seen dancing before her final run - won gold Monday. And when she told journalists about her secret groove, Lieberman's punk reggae band made out pretty well too: Strive Roots' Web site, which averages a few thousand hits a month, scored 37,000 one morning this week alone. 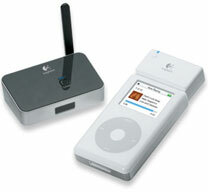 "But the biggest winner of all may have been Apple, maker of the tiny iPod that soared to glory along with Teter. This Olympics, U.S. snowboarders have competed while listening to the personal music device, and skiers, speed skaters and other Olympians from all over the world have been observed listening raptly during practice and before competing." "A U.S. security expert who devised an application that can fill an iPod with business-critical data in a matter of minutes is urging companies to address the very real threat of data theft. "Abe Usher, a 10-year veteran of the security industry, created an application that runs on an iPod and can search corporate networks for files likely to contain business-critical data. At a rate of about 100 MB every couple minutes, it can scan and download the files onto the portable storage units in a process dubbed 'pod slurping.'" "Being an audiophile is not easy these days. "Recently, I lamented how little attention lossless playback had gotten in my commentary on Ten Failed Tech Trends for 2005. An alert reader noted in the ExtremeTech forum that Apple had started supporting a lossless codec, and even supported playback of Apple Lossless on iPods. So I naturally had to pick up a 60 GB iPod and re-rip my CD collection using iTunes. "While the iPod and iTunes combination is certainly a potent one, I'm not quite in love with it...."
"You simply insert the Dock Adapter that fits your particular iPod model, then plug in your iPod. When you want to connect a different-size iPod, simply pop out the Dock Adapter and insert a new one." "This makes for some interesting usages. The obvious one is to link the computer in one room to the hi-fi in another, in much the same way Apple's Wi-Fi based Airport Express box does. More interestingly - and this is the one Logitech is pushing - is to plug one onto your iPod, Creative Zen Vision:M, iRiver T30 or whatever and turn it into a remote control. The bizarre thing: your remote is also your music store. Weird, huh?" "US manufacturer Battery Technology has come up with a rather neat accessory for iPod owners who've downsized to a Nano from an older third or fourth generation player, or from an iPod mini. It's a connector that allows you to plug almost all of your old headphone accessories into your new player. 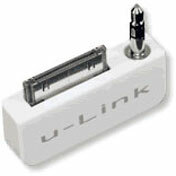 "The u-Link clips onto the Nano's dock connector and into the player's earphone socket. On the other side is a new 3.5mm socket and remote control slot ready for old iTrips, remote controls, iBeams and other accessories." PR: PodShirt offers specialized apparel designed to show off your iPod shuffle. Using a patent-pending magnetic clasp system, the iPod shuffle attaches seamlessly to the clothing to become part of the apparel design. No modification is needed to your iPod shuffle. Simply place it over the clasp area of the shirt and it locks into place. The shuffle stays firmly attached even with vigorous activity. A quick pull easily removes it from the shirt. The magnetic clasp system has been tested extensively with the iPod shuffle. Since the shuffle uses solid state flash memory it is unaffected by magnetic fields. 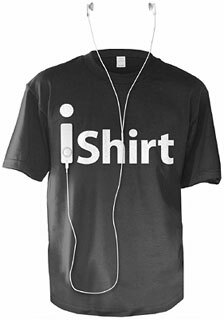 iShirt will only work with the iPod Shuffle. 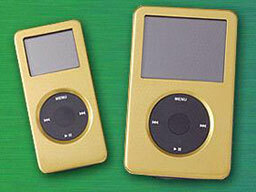 The magnetic clasp may damage the hard drives in the iPod mini or standard iPod. The clasp is removable so you can wash the shirt. Care instructions are included with the iShirt. PR: Meet iKitty- the cutest toy and case for you and your iPod nano! iKitty is fun and functional - offering great rubberized protection, bendable kitty tail, and screen protection for your iPod nano. Available in white (good kitty!) and black (bad kitty!). 4 legs, 2 ears, and a whole lot of personality! Insert iPod thru iKitty's bottom slot. Insert screen protector, rubbery side down, under the edge of the screen cutout. Bend tail to express desired emotion. Meow! iKitty is made of Silicone. The screen protector is hard ABS plastic with a soft rubber edge to further protect the screen. Because most cats look pretty much the same. They've got the 'cat shape', with two pointy triangular ears, 4 legs and a tail. There are so many breeds of dogs with so many different looks- we'd never be able to please all the dog lovers out there. iKitty fits both 2 and 4 gig iPod nanos in both black and white. You have full access to all buttons and controls while in the iKitty case! There are cutouts for the hold switch, headphone jack, port plug, scroll wheel and screen (screen protector included!). PR: GizMac Accessories LLC, designer and manufacturer of innovative products for the Apple platform, announce the Titan iPod Nano cases are now available for preorder. GizMac announced and displayed the new Titan iPod cases in their booth at the Macworld Exposition last month. The new Nano iPod cases are part of GizMac's emerging line of cases for the Apple iPod. "What separates the Titan iPod case from the competition, is the many number of ways the Titan iPod case can be worn," says Tim Cave, founder of GizMac, "The other great feature of our Titan iPod case is the incredible anodized aircraft aluminum finish, anodizing produces amazing colors not found in plastic, rubber or leather iPod cases…purple, gold, pink, aluminum and black will be our initial colors for our iPod nano cases, future colors will include blue, orange, red and others." "'Cause Everyone Wears Their iPod Differently" is the motto of the Titan iPod case for a good reason, the included carabiner clip, arm band, belt clip with 360 degree rotation (for vertical, horizontal or any position in between) and lanyard accessories provide a wide range of ways to wear the iPod case. The Titan goes even one step further with the ability to easily change whether the top or the bottom of the iPod nano case faces upward or downward, providing unmatched flexibility in an iPod case. In addition to its unique look from using anodized aircraft aluminum, the Titan iPod nano case also provides a superior strength to weight ratio by the use of lightweight metal. Not only does the aluminum Nano case protect the iPod, but the included screen and scroll wheel protector also shield the iPod from other potential damage. Further details on the new Titan Nano iPod cases can be found on the GizMac Accessories website. Information can also be obtained by calling the Southern California corporate headquarters at (800) 475-1677. PR: After a string of success with IceWear for other iPod models, TuneWear released IceWear nano in September of last year, only a few days after Apple released the iPod nano. available in a single pack as well as a three pack, IceWear nano was an immediate sensation. Well, we are not about to start resting on our laurels. We've made IceWear nano better! At the same affordable price, and still including the protective TuneFilm to keep your iPod safe from scratches, IceWear nano now also comes in Ultra Clear. Just like the rest of the IceWear series, IceWear nano Ultra Clear utilizes high density silicone as found in diving masks and our patent pending Rib-Technology to protect your iPod nano, however, this time it is crystal clear. For the traditionalists out there, regular IceWear nano will also still be available, so now you have the choice. We think that the iPod nano is the most beautiful iPod yet, and you need the serious protection that only TuneWear's IceWear with the included TuneFilm can offer to keep it that way. IceWear nano and IceWear nano Ultra Clear do not cover the wheel or the screen, rather it is intentionally left open for complete control and view. That is the way AppleDesigned the iPod nano and that is the way we leave it. Instead we have added embossed edges around the screen to help prevent scratching. With IceWear nano or IceWear nano Ultra Clear, your iPod nano has all ports open for easy access. Headphones, bottom dock connector, screen and wheel control are all open . So you can use the USB docking cable, hold switch, click wheel, all without having to remove IceWear. You can also use many of the third party accessories available that use the 30-pin port at the bottom of your iPod. Pretty cool, eh!? We launched TuneFilm with our products for the iPod nano and it has been incredibly successful!! As they say, when you are on to a good thing, stick with it. And that is exactly what we at TuneWear decided to do. We have included TuneFilm with all IceWear nano products, including the new Ultra Clear. TuneFilm is an adhesive protective film that covers the screen, click wheel and reflective back surface of your new best friend, keeping it looking as good as it did the day it came out of the box. PR: Monster has announced that the iCruze is now available at a new lower price. The iCruze, which connects an iPod directly to a car's stereo allows consumers to play their entire music collection through their car audio systems by acting as a virtual CD Changer. The cost of the main iCruze unit is now $69.95. The optional display for iCruze is now $39.95. Additional interface connecting cables and/or interface modules that match specific car models may also be required, which range in price from $9.95 to $29.95 depending on the complexity of the OEM stereo. This means that a customer can put together a complete iCruze package for $149.80 (that is a $280 price reduction for a complete iCruze system as compared to the previous pricing). It also means that some customers who only need an iCruze and an Interface Cable, and who choose not to purchase the LCD Display can own iCruze for as low as $79.90. "As the iPod continues to strengthen its reign as the world's most popular digital music player, we at Monster are excited to provide the solution that will allow music lovers to play their tunes wherever the car takes them," explained Noel Lee, The Head Monster. "With an affordable price, tremendous and easy-to-use functionality, and a host of compatible vehicles, the Monster iCruze makes it even easier for iPod and iPod mini users to listen to their entire music collection in their cars." "The iPod is the world's most popular digital music player," said Bob Borchers, Senior Director of iPod Automobile Integration for Apple. "Monster's iCruze provides an excellent way for music lovers to directly connect their iPod to their car audio system to listen and control their iPod in their car." Monster iCruze provides a way for a "direct connection" to most car audio systems. By acting as a virtual CD Changer, existing OEM radio/CD controls (including steering wheel controls) can access different playlists and songs. As an additional benefit, iCruze charges the iPod while driving. iCruze can be self installed, or better yet, Monster has an agreement with MobileToys Incorporated as Monster's National Service Provider for iCruze. Monster iCruze utilizes exclusive SoundGate technology that enables the connection of an iPod directly to a factory-installed car stereo or Alpine M-Bus compatible aftermarket car stereo through the CD changer port. Utilizing the iPod's dock connector, the direct connection to the car stereo results in ultra-high quality sound and performance. Additionally, iCruze users can navigate playlists and tracks directly through their car stereo CD changer controls (and steering wheel controls too, if equipped), as well as control volume. Each CD changer disc selection corresponds to users' favorite playlists with as many tracks as desired in each. A six-disc CD changer offers access to six playlists. A ten-disc CD changer offers access to ten playlists. And configuring playlists for optimal use with iCruze is simple and offers access to all tracks on the iPod. Taking into consideration an automobile's limited dash space, iCruze was designed to install using as little space as possible and is most often installed in or under the dash behind the car stereo. The dock connector cable can be installed so the iPod can be hidden away in the glove box, center console or can be dash-mounted. While professional installation is recommended for the best performance, iCruze comes with an installation guide and how-to CD-ROM for those familiar with car audio installation techniques and factory car stereo removal. The optional iCruze dash-mount LCD display is available to further enhance the iCruze for iPod driving experience. The display is a multiline, 20-character blue backlit LCD text display that displays song name and artist information, making iPod playlist navigation even easier. The display connects to iCruze via an RJ-11 (phone jack) connection and easily mounts onto the dash. For additional product information, pricing, dealer locations, and to find out exactly what iCruze hardware is required for specific car makes/models, visit the website. PR: iPodDisk is designed to make it easy and intuitive to copy music off iPod; it enables you to do so within the Finder, or whatever application that can read files. reduced iPodDisk.app size from 12.4M to 3.3M. redirect http requests to ipoddisk web site. added support for a new top-level directory "Albums". performance boosts via removal of unnecessary modules. upgrade http engine (lighttpd) to 1.4.9.
upgrade glib2 library to glib2-2.9.0. fixed bug 4: if multiple tracks have a same title, only one of them is accessible. fixed bug 3: keep track order in playlists. fixed a bug in Panther due to kextload. System requirements: Mac OS X 10.3 or later.